Endowed with its powerful and beautifully staged moon-phase display, the Rendez-Vous Moon of Jaeger-LeCoultre extends an enticing invitation to follow the guidance of the most feminine of celestial bodies. Jaeger-LeCoultre has opted to provide two versions of this new model, in 36 and 39 mm diameters. They share several characteristics, including the mother-of-pearl moon disc studded with constellations and sprinkled with cabochons representing the stars. Both versions come on a blue satin strap. 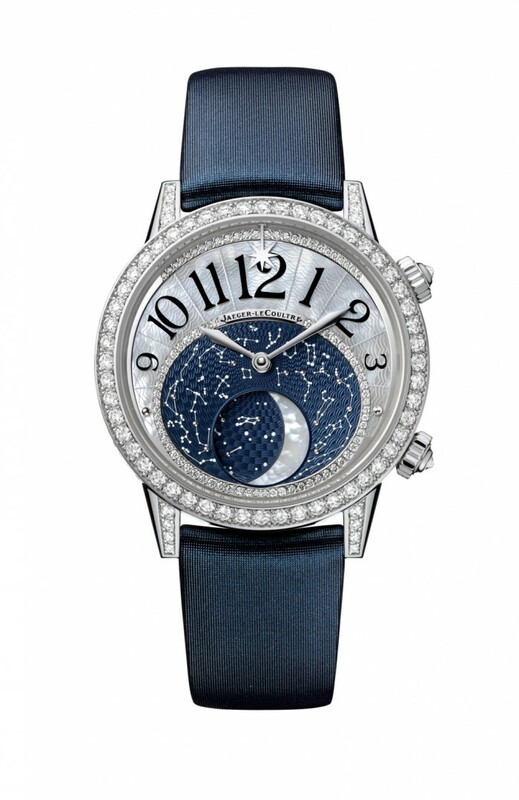 The 36-mm Rendez-Vous Moon features a dial bearing blue numerals that echo the deep shade of the sky. Sparkling with the radiant fire of 166 brilliantcut diamonds, this model makes a perfect fit on the daintiest wrists. A symbol of time, the moon is the hourglass of water tides and of our biological clocks. It is also an emblem of womanhood, alternately viewed as wife, daughter or sister. Its fertile, maternal image nurtures our imagination. Is it the milky colour conferred by the reflection of the sun – its husband according to the Incas – that has given it such a feminine aura? Others choose to see in it only the hidden, nebulous face. However, when positioned directly opposite to the sun that lights it up entirely, the moon shines with a benevolent radiance, illuminating the night with its full, glowing roundness. Meanwhile, its quarters serve to cultivate the mysterious aspects of its nature. The Rendezvous in 39mm. The two crowns are each set with an inverted diamond. One serves to adjust the time and the moon phase. The other guides the moving star serving to personalise time. The sky of the Rendez-Vous Moon is adorned with this delicate engraving technique performed using a dedicated rose engine that requires a sure hand to create beautifully intersecting motifs. 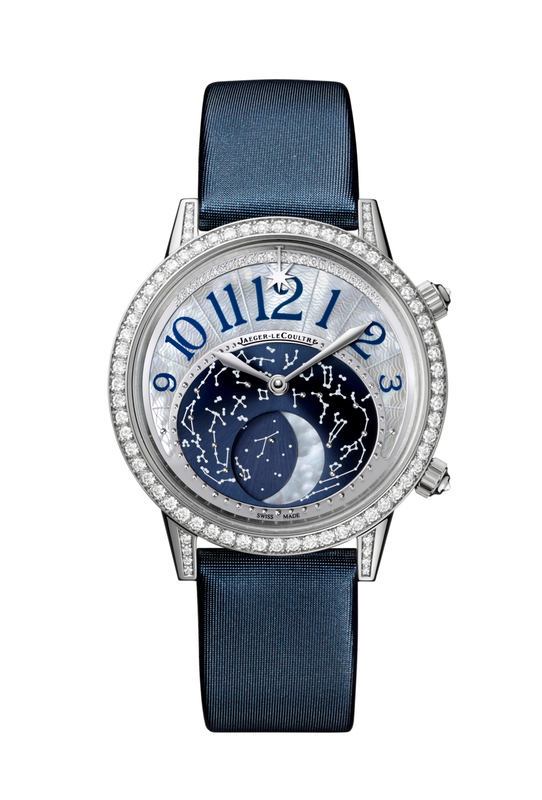 The resulting pattern is coated with a blue lacquer that induces a unique depth effect, drawing the gaze into the nocturnal expanses of the dial framed by a seductive row of diamonds. A total of 208 brilliant-cut diamonds play their part in the exquisite gem-setting of this captivating creation. In this new creation, the pursuit of harmony was more relevant than ever, the aim being to preserve the expressive and distinctive characteristics of the Rendez-Vous line, while giving the moon a space commensurate with its decisive role in setting the cadence of our lives. A sharp eye will immediately note that the crescent of the Rendez-Vous Moon bears a stylised hours arc distinguished by elongated numerals. It tops a disc affording a captivating vision of the heavenly canopy and occupies almost half the dial. The deep blue sky reveals the constellations and shines with a sprinkling of sparkling diamonds. The main highlights of this model, meaning the display of the passing hours and the calendar complication, thus divide up the available territory in a spirit of perfect equity – very much like the RendezVous Moon as a whole, in which technical and aesthetic elements play an equally important part. Watches and Wonders 2014: IWC Portofino Mid-size collection.